Bells have a centuries-long tradition of varied use in the navies and merchant fleets of the world. Signaling, keeping time, and sounding alarms are important in a ship's routine and readiness. Their functional and ceremonial uses have made them a symbol of considerable significance to the United States Navy. It has long been a naval tradtion for the ships' Bosn' to make the first pot of coffee on the mess decks, while the cook would polish the ships bell. Additionally crew members sometimes asked the ships' chaplin to christen newborn babies in the bell filled with water. USS Concord's bell was removed prior to sinkage and has since been relocated to the below information. In addition a search has begun to locate the ships bronze minuteman statue and commissioning plaque. As these items are located we will provide the details at this page. Anyone with knowledge relating to these treasures are asked to contact the webmaster below. 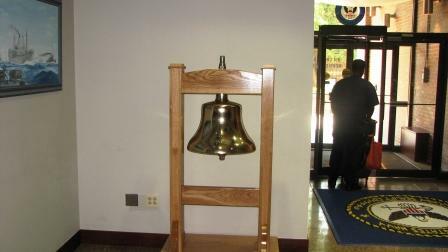 The bell is located in the main entrance lobby on the first floor. 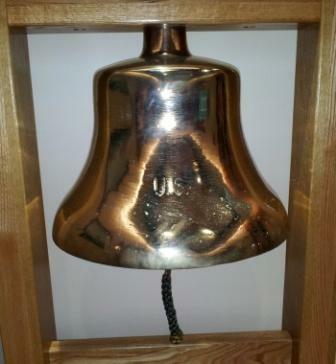 Actual pictures of our bell is below. 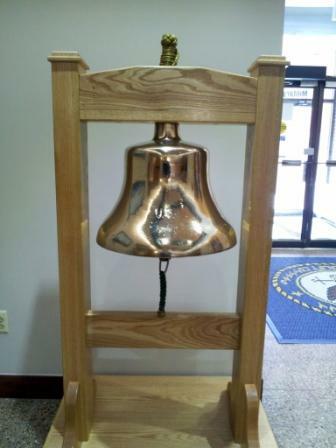 If you visit her, send me a pic with you and the bell and I'll add your story to this story! Those of you who have visited our Concord History page, or are History buffs know that our USS Concord "AFS-5" is the 6th ship to wear that name. USS Concord, CL-10, was the 5th, and launched December 15, 1921 and commissioned November 3, 1923. During WWII she served in the Pacific in the Kurile Islands and Japan. She was decommissioned on December 12, 1945 and sold January 21, 1947. 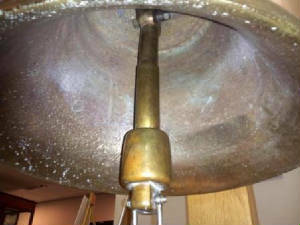 CL-10's Bell however was preserved and presented to the Town of Concord in 1947 at the Concord Free Public Library. It was later moved to the basement of the Town House (in 2003) where it remained unseen until now. 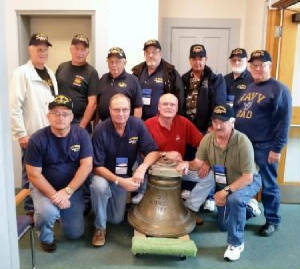 The Rotary Club of Concord held a dedication ceremony honoring the Bell's installation at the Veterans' Memorial on Main Street in Concord Center.